All members of SMGA, citizens of San Marcos and Hays County, and residents and visitors from around Central Texas need to be heard on the issue of Capes Camp. A well meaning, reputable developer has come to town from Georgia to build some much needed student apartments here in town. No surprise. 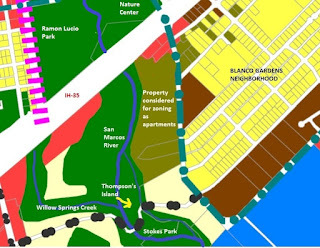 They chose to locate their development on the San Marcos River between IH35 and Stokes Park to include the greater part of Thompson’s Island. That the city, meaning all of us, has not already secured this one of a kind location is tough to understand considering the overwhelming demand from all of us for more river and frontage access, water and riparian protection, and trail connections. This is an integral connection for the greenbelt vision. Well it is time to start working on it now. Angie Ramirez and a group of Blanco Gardens neighbors have the momentum going with their first appeal to the Parks and Recreation Board to issue a memorandum to the Planning and Zoning Commission in which the board “fully supports the Blanco Gardens neighborhood’s vision” of this property as eastside parkland. PLEASE ATTEND: 6 P.M. Tuesday evening, City Hall, Planning and Zoning Commission meeting. Blanco Gardens neighborhood rep Angie Ramirez will speak, along with several others, in the citizen comment period at the very beginning of the meeting re the need for a riverside park east of IH 35 to connect our very crowded and worn river parks with the east side of IH 35. There is a lot of state and city owned land there beyond Stokes Park that would create a big swath of riverside park if it were only connected. But instead, another apartment project might take the land that could provide this connection, Cape’s Camp. Many of us would rather see a parks bond proposed for November 2013 ballot, and a unified effort to raise funds and grants to make this a park instead of apartments. Please attend, no need for everyone to speak, but the visible support of many citizens will make ALL the difference. Please take time to spread the word to all your friends via Facebook or email, or any way you can tonight or tomorrow. See you at 6 on Tuesday, and here is the agenda packet re other issues that will be heard later that night, if you want to stay: http://www.ci.san-marcos.tx.us/index.aspx?page=827.